How to buy a Reading to Kids t-shirt! 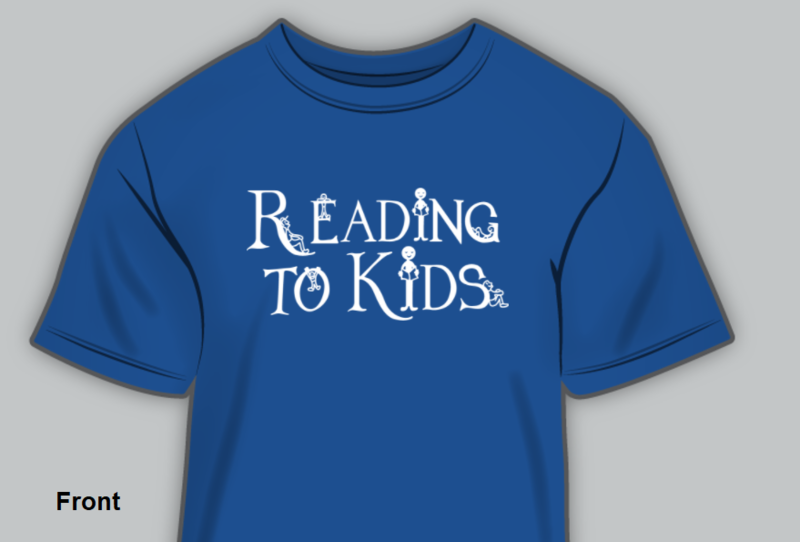 We occasionally have a "group order" for ordering a Reading to Kids t-shirt at CreateMyTee. If the above group order status is "Closed for now", then please email us at info@readingtokids.org with the subject line "Reading to Kids t-shirt order request" and include your name. Once we have enough order requests, we will open up a new group order and send to you the link to order a t-shirt in your size that you can have mailed to you. The shirts are royal blue Gildan Heavy Cotton T-Shirts, with white ink printed on the front and back. Gildan's advertises these shirts as "pre-shrunk" - but since they are 100% cotton they are still likely to shrink about a half size, depending upon individual factors. The sizing guide can be seen here. On the CreateMyTee website you will order your size of t-shirt, enter your payment information, and also enter the mailing address to which you want the t-shirt sent. Please do not enter the Reading to Kids office address for mailing your shirt. Each group order link must have a deadline, at which time the order must be reviewed and officially checked out by one of us in the Reading to Kids office. This is how CreateMyTee offers bulk discount pricing, since every shirt in each batch will need to be printed together. 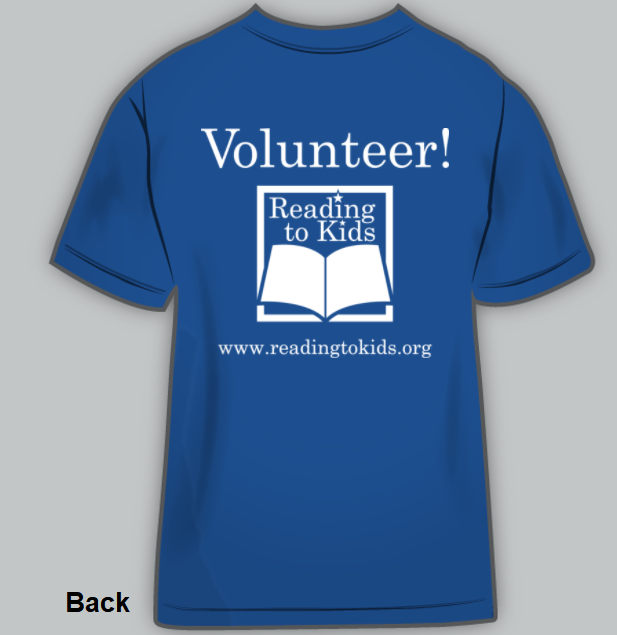 If we do not currently have a group order open towards the top of this page, you can email us at info@readingtokids.org with your name to tell us you want a shirt. Once we have enough emailed requests, we'll open a new group order and inform you it is open for you to order your shirt. The cost per shirt depends upon how many shirts are ordered in each group order, with a minimum required of at least 10 shirts in a group order. Thus, when you order your shirt on CreateMyTee, you will see a range of costs per shirt, since the final cost will depend upon how many other people also order shirts in that group order. – If 10 total shirts are ordered, each shirt will cost $18.99 per SM-XL (with an additional $2.00 for sizes 2XL-5XL), and an additional $5.00 per shirt for shipping & handling + .25¢ as an individual order. That is a total of $24.24 per shirt for most sizes, $26.24 for 2XL and larger. – If a total of 20 shirts are ordered, each shirt will only cost $11.98 per SM-XL (with an additional $2.00 for sizes 2XL-5XL), and an additional $5.00 per shirt for shipping & handling + .25¢ as an individual order. That is a total of $17.23 per shirt for most sizes, $19.23 for 2XL and larger. – If the order totals 25 or more shirts, then the cost per shirt is .73¢ less. If even more shirts are ordered, then costs will be reduced even further. – CreateMyTee requires at least 10 shirts in a group order. If we do not meet that 10-shirt minimum at the group order deadline, then we in the Reading to Kids office may extend the deadline to allow more shirts to be included in the group order. Or, we may need to cancel the order, in which case you will not be charged for a shirt. When you order your shirt on CreateMyTee, the payment method is saved under your selection/account, but you will not be charged until the group order is reviewed and checked out by the Reading to Kids office. That's also when you find out the exact amount the shirt will cost (since it's dependent upon how many shirts are ordered). If you don't enter a payment method with your order, you'll see a message box that your selection won't be saved without a payment method. All payments and shipping are handled directly by CreateMyTee. Standard turn-around time for individual-ship group orders is roughly 2-3 weeks once the group order deadline has passed and the order has been officially checked out by one of us in the Reading to Kids office.